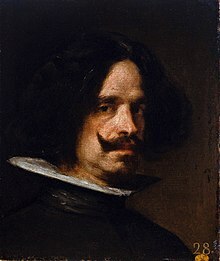 Diego Rodríguez de Silva y Velázquez (Spaingie: [ˈdjeɣo roˈðɾiɣeθ de ˈsilba i βeˈlaθkeθ]; (baptized on Juin 6, 1599 – August 6, 1660) wis a Spainyie penter that wis the leading airtist in the coort o Keeng Philip IV an ane o the maist important penters o the Spainyie Gowden Age. He wis an individualistic airtist o the contemporary Baroque period. In addition tae numerous rendeetions o scenes o historical an cultural signeeficance, he pentit scores o portraits o the Spaingie ryal faimily, ither notable European feegurs, an commoners, culminatin in the production o his masterpiece Las Meninas (1656). Frae the first quarter o the nineteent century, Velázquez's airtwark wis a model for the realist an impressionist penters, in pairteecular Édouard Manet. Syne that time, famous modren airtists, includin Pablo Picasso, Salvador Dalí an Francis Bacon, hae paid tribute tae Velázquez bi recreauting several o his maist famous warks. This page wis last eeditit on 6 November 2018, at 04:14.